Epiroc / Atlas Copco Secoroc’s COP hammers have long enjoyed an unparalleled reputation for productivity and the lowest cost per meter drilled. Our brand new 5” hammer, COP 54 Gold Express, has pushed the Gold concept a step further. Like COP 54 Gold, the COP64 is regarded as the toughest 6” hammer ever built, this unique solution is not only a rugged addition to the world’s premier range of DTH equipment. It can also handle pressures all the way up the 30 bar, while delivering a host of other improvements where it really counts – in the productivity department. 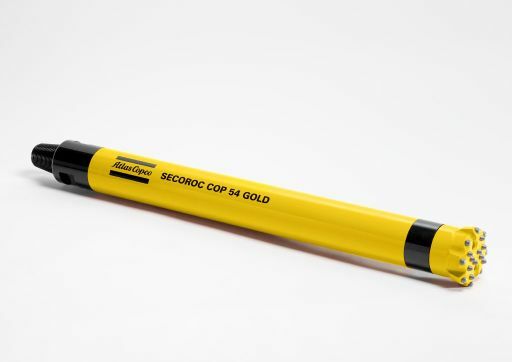 The COP Gold line of Epiroc / Atlas Copco COP Hammers are some of the most versatile and durable DTH hammers on the market today! Specialized steel construction makes these hammers ideal in even the most abbrasive applications. Looking For a Replacement Cop Hammer or Parts? Rock Drill Sales knows that with everything else you have to keep up with on a job site, sometimes it's difficult to remember every part number of every piece of equiptment that you'e using! If you are in the marketing for a replacement Atlas Copco COP Hammer or you are looking for parts for an Atlas Copco COP Hammer, use the guide below to decypher the code on your existing hammer. If you are ready to purchase an Atlas Copco DTH hammer or you have additional questions, feel free to contact a member of our expert sales team. If you are interested in other types of Atlas Copco DTH hammers, shanks and bits, click here to access Rock Drill Sale's full catalog of DTH products and tools.